The original sports car look. 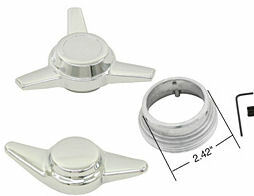 Choose from 2 or 3 spoke spinner style knock offs. Both types fit mag wheels and are available in Chrome or High Gloss Black. Includes Mounting Hardware. Click product options tab to choose yours.